Purposeful organisms that stir the substrate are of tremendous use. I had a FOWLR aquarium running for years until Hurricane Sandy knocked out power for 2 weeks and everything died. Tank has been laying idle ever since, still filled with water, sand, and rock. Pumps, skimmer, lights, etc have not been turned on in 6 years. I want to start her up again. Any advice? I am about a month into the set up of my new tank, and I have several curiosities that I am puzzling over. As you all are always here for me (and I REALLY appreciate that) I thought I would send them your way in the hopes that not only can you answer my inquiries, but also that they might perhaps help someone else as well. it would kill the coral and a lot of the other cool life on the live rock. So, on the advice of a friend (who owns the LFS store where I got the rock) instead of going ahead and putting in all the dead rock, I am adding instead one or two of the rocks per week so that the bacteria can build slowly and handle all the dead stuff on the old rock. I have also washed them off really well—spraying them with a hose and also immersing them in water several times. All of the dead rocks except one are less than 5lbs. each and a few are really small. I’ve added four this way (less than 10 lbs. so far), and so far all is well. So now for the first curiosity. When I put the new live rock in the tank originally and left it for several days, I expected a brief cycle—it was well cured, but out of the water for almost two hours on the way home. But I never got one. For the few days that I left it in the tank by itself, I did “feed” it a small pinch of fish food every other day. In fact, I have had no evidence of a cycle at all—even putting in the four dead rocks so far (over the last two weeks).I’m not getting any ammonia or nitrite (which I didn’t expect to get), but I’m not getting any Nitrate either (and I have a brand new Nitrate test, and an older one too).It is just a standard Nitrate test (not a low level one), but it keeps reading 0—certainly not 5ppm (the next step up on the color chart).I would have thought that after having been in there three weeks that I would be getting some kind of Nitrate reading. I am getting some algae this week—some diatoms and a little bit of hair algae. I’ve had to use my lights more because of the coral. I did set up my skimmer (Aqua C EV-180) a few days after I put in the new rock. This is the first time I’ve used a skimmer (I didn’t have one before), but it was easy to follow the directions and install it. It didn’t skim anything at first (during break-in).It just churned the water, but after I put in the first of the old rocks it started skimming some dark gray water. It will slow down after a day or so, but then when I put another old rock in, it will produce some more. So here are my theories on why I am not getting any Nitrates.1. The live rock is substantial enough (and the waste is still small enough even with the four old rocks) that the denitrifying bacteria in the live rock is removing the Nitrates as they are being produced.2.The Nitrates are being used up by the algae in the tank. In addition to the diatoms and hair algae, there are lots of coralline algae that seem to be growing before my eyes.3.The skimmer is removing a lot of the dead stuff from the old rocks before it can go through the cycle.4.All of the above. Thoughts? up. During this time the rate of evaporation slows way down. I'm not losing that much liquid in the collection cup itself. It's evaporating more rapidly. I guess I was curious as to why this is the case? Again, thank you for always being there for me (and all of us).I have learned so much from your site and from the inquiries that I have sent in. I had a follow up comment to your responses to my email yesterday. I actually never got the email response, but I saw your comments in the daily FAQs. This may be because I accidentally sent yesterday's email through one of my work accounts. I'm sending this one through my personal email, which I have always used with WWM before. For your convenience I copied/pasted the email and response from the daily FAQs page below. and then arranging the new rock on top of it. I even have holes already drilled in the old rock and zip ties already inserted so that I can attach the new to the old. Thanks again for all your help. I hope that your diving trip goes very well. After I realized how much fine sand was staying in the water column I decided to buy a whole house filter with a 15 micron cartridge piped it into my sump then ran it with a maxi-jet 1200 and began the process of stirring my sand over the next two weeks to remove all of the sand that was to fine and stayed in the water column. This approach worked very well and all extremely fine sand was removed. Through this 2 week process various bug such as moths and what not made their way into my tank. I left them in thinking they could possibly start the cycling process for me. I know its not a shrimp or what not but don't see how it would not. My question is when i stirred the sand over these two weeks the tank water would become cloudy as expected but as the sand was removed it began to look more like a bacterial bloom then that of sand and i was wondering if the cycling process had already begun. Did stirring the sand maybe increase the cycling process due to die off from stirring the sand? I did not test the parameters of my water during the 2 week process. The reason I ask is because i put 2 decent size shrimp in my tank over 4 days ago and I am still not having any ammonia or nitrite spikes. I tested both of these parameters twice a day for those 4 days. Could my tank have already cycled in the 2 week sand stir period and cause the issue of not getting spikes in ammonia from the shrimp? Having a hard time figuring this one out. Thanks for your help and happy Independence weekend. Would you advise to keep lights on when doing this and also put algae into the refugium. From the start ? I did that along with ph and alkalinity testing. I was surprised to find the water testing positive for both nitrite and nitrate at 2 and 20ppm respectively so soon. I had coming from the tap. Now I have to try to figure out is this tank cycled once the total ammonia and nitrite levels go to zero? to get rid of excess nitrate that’s in the tank after cycle and before any thing living goes in and the get ro/di unit to do water changes from then forward. Right now I’m getting sporadic free ammonia readings (sometimes 0.2 or so , sometimes zero) and a consistent total ammonia reading of 0.5 every few days when I test. Nitrite and nitrate still holding about the same at above mentioned numbers and I’m about 1 1/2 weeks into the cycle (which is still way early, I know and understand that). I just wondered if there is going to be a drop in the nitrite since it’s not being converted but pre-existing in the water? I’m sorry if this seems like a silly question ( I’m not the best with chemistry) and wanted a second opinion on what to expect. Thank you for your quick reply and I have solved the mystery of the faulty water! After receiving your email last night I decided to test the regular tap (unfiltered) and there were no nitrites and maybe 1ppm nitrate in that water, so I have to conclude that my filter was installed incorrectly or backwards! If I hadn't decided to start up a tank and had not contacted you it may have been quite awhile till I noticed anything amiss. I will now contact the company and find out how to fix this mess along with the handyman who installed it and give him a piece of it. I may also have to drain tank after all if anything worse that nitrite and nitrate got flushed into that water. may call upon your expertise to say yea or nay, if that's ok with you. For right now until I have the facts everything will be in stasis. Thank you for possibly saving mine and my family's life, we are so very grateful you do what you do! I have setup the aquarium as per plan, however I took about 10kg of existing live rocks from my nano tank and used a chiller (temperature is now 27-27.5 degrees C). Although the NO3 is 5mg, I am reluctant to add any fish. I feel I should give more time for the tank to stabilize first; although not sure how long. I would really like a mandarin fish down the road. Objective is how to sustain a thriving pod population? I have researched and concluded that the area per square feet of sand and rocks (rather than per pound per gallon) as a better guide to increase the opportunities for more pods to grow. At the moment I have about 30 kg (66 pounds) of live rocks (I prefer open spaces than packed corals/rocks). I believe many would say double the amount would be needed to sustain it. As such I plan to hammer away some new rocks and epoxy them into small rock rumbles and scatter them around the tank. I hope to add 10-20kg in total weight of these rock rumbles and 5-10kg in the sump. diatom is a phase most aquarist go through, after which diatom though may be present isn't on a large scale. If I have not much algae in my tank (possibility nutrients strip dry from usage of pellet), would there be sufficient pods to sustain one mandarin? I have a less favored option: mini refugium either in the sump or hang-on aqua clear 110 with macro-algae present. My name is Holly. I am new to the Marine Aquarium hobby. I setup my 55 gal. FOWLR tank on 10/20/13 with a Marineland Pro Series Emperor 400 Bio-Wheel Power Filter, and both a 550 & a 660 undergravel power filter with Aqua-Pure Phosphate filter pad in both and activated carbon cartridges in the 400. I do not have a protein skimmer. I'm using 2 18" Zoo Med Reef Sun 50/50 bulbs. On 11/9/13, I added 2 Yellowtail Damsels, 2 Yellow Damsels & 3 pieces (approx 10#) Live Rock. And a tiny little crab-like being (Mr. Crabs) that snuck a ride home on one of the pieces of LR. Now I understand that PATIENCE is a must here, however, everything I've read suggest that by now I should be seeing a spike in the Ammonia at least. I test the water daily at about 8 AM with an API Saltwater Master Kit. It tests for pH, ammonia, nitrite & nitrate. I keep the temperature at 75-77°F. And my sg remains at 1.023-1.025. My pH is a steady 8.2 with the exception of a drop to 7.8 on 11/13/13 that I corrected with a 10% water change. Everything else is Zero and has not fluctuated at all. The fish are doing quite well. Bashful, a Yellowtail hid a lot the first couple of days (hence the name) is out and about more now & Herbert his tankmate is doing well. Brutus a Yellow (and he/she is a brute) hid a bit the first day or so but now tends to pick on both yellowtails and a little on his tankmate Flo. Nothing major, just chases them off his "territory". No one except for Flo ventures to the right side of the tank (my pro-series is on that side). Flo is my greatest concern. She/He is a paler than her tankmate and has been displaying some odd behavior. First she/he is a bit fatter than Brutus. She has dug holes in 3 places under rocks and kind of quivers and swims forward and backwards in & out of the holes. I'm thinking she might be a he and "really likes" his tankmate and is trying to make an impression on him/her, or she is filling up with eggs. The puffy belly (no dark spot) has me thinking along those lines. 1) Why haven't my ammonia, nitrite & nitrate levels changed? 2) Is there a way to kick start them without hurting my babies? 3) Could the water change have slowed it down? 4) What's going on with Flo? 5) Should I be worried about adding more fish? Can I? thought about a starfish like in the movie (Pink), but I'm having difficulty finding exactly what I want so may do without. Is there something I should be looking at? Anyone I'm missing? I don't think I have a lot of cleaners in there. I'm hoping to make it a Reef in the next 3-5 years. Would love to get some anemones and fancy corals eventually. Thank you in advance for your time. I know I'm asking a lot of questions. I am at a loss as to 'what to do' at this point in my tank. so for now, I'm waiting till I need something else to make it more cost effective! So, with all that out of the way,....... diatoms began to show about 10 days ago. I have not done a water change nor topped off the tank since set up. I was concerned that it may create another cycle? I added 2 small Blue Chromis and a Brittle Star that have been waiting patiently in quarantine! This is my third attempt to get this reef "thing" right! I don't want to make a move till I am certain it's the right one! And like I have said before, you guys are the only ones I trust,...period! It's a jungle out there, with such a cacophony of snake oils and opinions, doing something wrong scares me to death! Thanks Bob,...I didn't realize I hadn't actually asked a question! Should I start with water changes? But I think you answered that! Secondly, "Amazon Prime" is $79.00 per year. No can do,...now. haha! I'll consider the Amazon Prime! <Worthwhile... if you buy/ship much from them; will use the video... My sis and I don't have cable... but have a laptop/net hook-up a cheesy (but functional) aerial that brings in some hundred channels from LA, Netflix (7.99/m) and Amazon Prime... The Green Day song re motivation comes to mind. I want to thank you first for a great site! OK, here is my question/problem. I purchased a 35 gal tank because I wanted to start a saltwater aquarium. I got some books and read through every one of them. This January I started got it running and got all the necessary things like filter, heater, water, etc. I have a Rena Filstar XP canister filter for it and seems to be doing well. Now here is where I wonder whats wrong. About 2 months after it started up I thought I would put a fish (blue Chromis) in to help the nitrogen cycle because it hadn't worked yet (I also have 21 lbs. of live rock). The next day the fish died and I don’t know why all of my tests conducted by API saltwater testing kit said everything was perfect. Now four months into it I tried putting another Chromis into it and it also died the next day. It still says everything is perfect and I guess it still hasn’t cycled. Another thing is for about the lest month-2 months there has been a diatom outburst that hasn’t gone away, I also change my water weekly. I am restarting my 120 Gallon "Reef Ready" tank that has been down for a few years. I have my Live rock, that has sat outside in the MN sun and snow for about two years that I am reutilizing. I have rinsed it off, soaked in a light chlorine solution, about 5% or so, for three to four days, rinsed and soaked it in tap water for about a week, and changed the water on a daily basis, sometimes twice a day. I left it in the sun on my driveway for about 8 hours to dry out a little, turning them over once or twice. All looks good from what I can tell and smell. and spent about an hour rinsing this off as well. I now have all the sand and my rock in the tank. The salinity/SG is a little low according to my hydrometer. Just below the outside "ideal" area on the scale. I am working on bringing it up to a "good" level. All in all, I think things are going pretty well with a "Dead" tank. While working on doing this, I have also installed my power heads and heaters, the Protein Skimmer and return pump are going in the 30 Gallon sump I have. Yesterday while I was looking at a few things, I have noticed some brown patches on my sand, some of the rock and front and sides of the tank. I am thinking this is just patches of Diatoms and part of the cycling procedure, but my main thought is that if I haven't introduced any bacteria into the tank, no fish or food, where are these coming from. If the live sand is not supposed to have anything actually alive in it, could it still be filled with some bacteria that could start the cycling process? I have also purchased some Prodibio vials from the LFS to help in the cycling procedure, but have not introduced them to the tank yet. Not sure if they are needed, especially with the bloom I am already seeing. Was also thinking about the DR Tim's One and Only to aid in cycling, but see about as many cons as I do pros for this product. Do you think the bloom I am having is the cycling process starting without me? What are your thoughts on the additive bacteria's mentioned? It's been some time since I've written in with a question, and I wouldn't be but I can't seem to find anyone that had had a case quite like mine on your site. I have a 55 ga. bow front, corner tank (marine). My last fish passed over two years ago and due to life happening as it does, I haven't kept up with any maintenance of the tank besides adding fresh water when it was getting low. I have 50lbs of live rock (this is the reason I didn't tear it down, I paid too much for that rock, lol), and am running an Eheim 2215 canister (with a new bag of ChemiPure), two MaxiJet 500 power heads, and a newly installed Aqua C Remora. I did a 50/50 water change yesterday, and cleaned the Eheim as well as installed the new skimmer. What else can/should I do before it's ready for fish? I'm sure it'll cycle again, so what's the best way to initiate this in my particular situation? I'm still showing trace amounts of nitrates so should I do another water change, and if yes should I do it before or after the new cycle? As an update, I went to one of my LFS over the weekend to get my water tested as I found out that test strips actually have an expiration date (oops). They told me my nitrates were zero, pH 8.4, ammonia and nitrites zero, but my alkalinity was off the chart. So I bought some new test strips and a full testing kit by API. I decided to test everything to keep a record of parameters and to try out the new kit, and it turns out the LFS did the test wrong, and my nitrates are off the chart as well (well over 140ppm). I've already done two water changes, a 50% and a 25%, and I know the alkalinity is my own fault as I was adding buffer to raise the pH using the old test strips as a guide. I have 20ga. of water at home cooking right now for another 50% water change to help the alkalinity, but I don't know what else to do to get the nitrates to come down before I add animals. Is my biological filter dead? I have the canister filter running with de-nitrate (added three nights ago) bio-media, and a new bag of Chemi-pure. <Don't expect overnight results with De-nitrate or the AquaC skimmer. It will take quite some time. Personally, I find (newer product) Bio Actif from Tropic Marin to work quite well in lowering nitrate in tandem with a protein skimmer. May want to have a read here. I also have my Red Sea Prizm skimmer running while the Aqua C is going through it's break in. What else can I do to get the nitrates to an acceptable level? Oh, and I use Instant Ocean sea salt mix. Thanks again!! Hello again James, and once again thanks for you expertise and insight! I did another 50% water change last night and retested everything five hours later. The test kit I'm using (API) is showing my NO3 at well over 140 ppm STILL, and my KH at well over 214 (off the chart as I had to add 15 drops to turn the test water yellow, and the conversion chart only goes up to 12 drops). I'm lost as to what else I can do. Nothing seems to be helping my water comeback to acceptable levels. I've been toying with the idea of replacing all my substrate (crushed shell mix that I've been using for over five years) with a shallow sand bed possibly made up of live aragonite. What would be your thoughts on this? Would it help my KH and NO3 drop? Oh, and I've been running the Aqua C for a week now and have no foam as of yet, and the Red Sea skimmer is barely producing white foam..? <The AquaC should be producing foam by now. What brand/model pump are you using with it? Also, if you have a foam filter on the feed pump, remove it as it will lower gph to your skimmer. I would remove the injector access cap and clean as per the instructions. It may be partially clogged with debris. As to nitrate control, read here and related articles found in the header. 'cured' from LA, two-day shipping. The plan was to use this rock to cycle the tank. In the face of two different schools of opinion on the issue of how best to preserve as many of the hitchhikers as possible, I elected not to scrub the rock; only to remove and large, clearly dead organisms. showing up and is now around 1.5 ppm. So we're cycling, but the nitrite is climbing very slowly. Not sure if there's a 1:1 linear relationship in converted ammonia / nitrite. I'm concerned that in trying to preserve the life on the rock by not scrubbing I'm actually causing more of a problem by nuking the rock with way, way too much ammonia. I've done two 10% water changes two days apart, and even after these changes I'm still enough above 8ppm that I can't detect the true value. 1. Remove/Scrub all the rock, flush the water, try again. 2. Ride it out with 10% water changes every other day as I've been doing. 3. Ignore it and let the cycle do its thing. <Well, what you will end up with is "cured" rock that is all too common. 4. Increase the size and frequency of the water changes, trying to keep the ammonia within my testable levels. It would also be possible to start running the Chemi-pure and Chaeto now, though I have heard this isn't the best idea. There's a ton of advice on WWM in this regard, but it seems there are differences in opinion as to the best course of action to take. All ears! I did some testing mixing a new batch of saltwater with tank water; looks like an 80% water change will get me to at or near 2 ppm or so - assuming that it's a linear thing the tank has been at or near 10 ppm for a two to three days. Any odds that there's a chance of saving some life, or at that level am I pretty sure to be fighting for dead (albeit cycled and bacterially stocked) rock? Excellent. Have the ammonia down between 2-4ppm tonight, another 90% change tomorrow to keep it low and will keep up with it at that level. I ordered an Eshopps HOB to skim it out which should be here by the end of the week. and I asked for a lot of life and diversity - they probably sent very nice pieces that had a lot of die off in 48 hours out of the water. I'll let ya know how it turns out when the cycle wraps up. Just another quick question. I have just set up a 40 Gallon FOWLR system, with the equipment listed. JuweL Vision 180 with internal filter removed. 24 Pounds of Live Rock. 20 Pounds Coral Reef Live Sand. Protein Skimmer with a needle wheel venturi pump flow rate: 1850 L/H. Now for my question, I started everything up on Thursday 7 Jan 2010 and I have just done my first full water tests. Now I know my PH is low but I did think my other results would be a lot higher, is there any reason for this or will all of a sudden they rocket? Also with the equipment I have I was wondering how all the detritus is removed with no Canister filter set up. I do have one but I wanted a minimal set up and didn't also want anything that could cause high nitrates as these have been called nitrate farms before, or is it the job of the clean up crew when added and my maintenance regime. 1.5" of live sand and filled the tank with salt water. I used dechlorinated tap water on the recommendation of the LFS. The tank ran like this for about 1 week at which time I checked for ammonia, nitrite, and nitrate. As expected, all readings were zero. I then visited the LFS to pick up some live rock and discuss how to kick off my cycle. I bought a small amount (6 lbs) of rock <Was it live rock? Was it cured?> and placed it in the tank. I wanted to start with a small amount since I've never dealt with live rock before and wanted to get an idea of how to work with it. The LFS recommended I buy some flake food to add to the tank in order to help start the cycle, which I did. <How much, how often?> The tank has been running for 6 days since adding the rock and food. I've checked ammonia and nitrite a few times, but everything still reads zero. Is this too little bio-load to start a cycle? <Keep checking regularly. Be patient. Cycles can take up to 4-6 weeks. Don't rush the addition of livestock.> Should I add more live rock? <Not really too high at all, in my experience. My LFS sells their salt water at 1.025 specific gravity regularly.>. Thanks for your help, and sorry if this has been asked before. I scrubbed the walls and turned the lights out for 3 days and it has receded. <I might let it grow for a while, it is a great nutrient export. Snails and hermits could make a feast of it, if you're planning on adding clean-up crew.> This is in addition to the brown diatom outbreak which has also receded. <A sign of progress.> In spite of all this I am still reading zeros across the board for ammonia, nitrite, and nitrate. <Sounds like you might have had REALLY good, fresh, cured liverock, so you had no noticeable cycle.> I've been able to boost my pH to 8.0 through treating some Aiptasia with Kalkwasser, and my water temp is 79 degrees. <Both sound pretty good to me.> I intend to build up my live rock to about 24 lbs, and concurrently add a few small fish once I cycle. Candidates include clowns, cardinals, gobies, etc. I'm still not sure why I am not seeing any signs of a cycle three weeks after first adding live sand. Ok. I have abandoned the whole oak n brass shipwreck theme. I just built a series of caves and shelves out of rock, granite and sea shells. Over a week ago I made the switch over and did a 50% water change. Now I am battling ammonia levels. 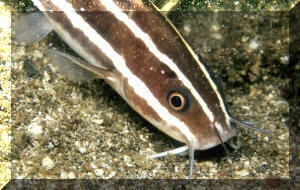 The only "live" things in the tank is the LS, LR (in the sump and overflow), and some vegetation (do not know the name. Got it from one of our LFS who had it in their refugium) what could I be over looking, to cause such high ammonia levels? P.S. Tank is 120g I upped my sump to 65g. Water started cycling about 7 weeks ago. I am setting my first marine tank (have kept FW Cichlids for 4 years now). After about 3 months of reading (This is a great site and lots of wealth !!) here is what I narrowed down to for equipment. I will start with FOWLR and then add coral slowly. Everything goes under the tank. What I am confused about is how to start this setup initially. I mean, should I load the refugium with MUD ( 5 - 6 inches I guess?) and put the micro algae (Chaeto) in the fuge and then fill water and cycle everything with live rock? I am not using bio balls. I plan to start with 75lb rock in tank and 25lb in fuge. Can I cycle everything together? I was planning to use BIO Spira (have used in FW with great success) for speeding cycling. If I use BIO Spira will that harm the micro alga in fuge? How do I start placing rocks in tank? I have read different things about this. Should live rock go on bare bottom of the tank and live sand around it or should I lay down live sand and then add rock on top of it? How deep should the sand be? I have read about gas pockets in sand if too deep? <1" or less or 3" or more. DSBs get a bad rap, don't be afraid of them. I will upload the plumbing design in my next post. I actually got the tank already. AGA 150 gallon drilled tank with 2 overflows. What are my options now? Hey guys. I just started up a 40 gallon salt water tank about 10 days ago with about 2 inches of live sand and about 20 lbs of cured live rock, and 3 blue damsels. I also added some sort of bottled product that is suppose to enhance and speed up the process (I forget the name of the stuff, got it at a local fish store) I just did my 1st tests of the water today and the ammonia and nitrites are next to 0, and there are a little bit of nitrates. Also, algae is growing on the glass, sand and rocks. Is it possible my tank has cycled already?? I thought it took like 2-3 weeks? Thanks, Jeff. <Yes, if you started your tank with live sand and cured live rock, you may have completed the cycle already. But, that does not mean your tank is ready to stuff with livestock. Leave your tank mature a bit and gather "good" bacteria so it can handle a larger bio load. Keep testing, don't add anything to the tank until the nitrates are gone, and then begin slowly. So it would be ok to add a few hermits and a few snails, just to help with the algae, but don't load it up with fish yet? I have a question about my current set-up and where I like to go with it. I currently have a 75g reef set-up to include SPS, LPS and clams, and of course fish. The tank has been running for 4 years. I currently use a tide pool 2 overflowing into a 40 gallon trashcan, and a Eheim 2 canister. My trashcan has oversized Lego's for the anaerobic bacteria, and the tide pool has the aerobic bacteria. without the aerobic wheel. Question is how detrimental will this be, and is there anything I can use to help the process. I have a plan in place to include the wheel in the drum, but it is going to be a pain in the dairy air. James, I'm currently traveling, and I will send a picture of the setup. I guess the bottom line is can I remove the aerobic wheel from the system without causing a major problem with my system since I have both a aerobic source and a anaerobic source independent from one another. I do have a picture I included of my tank, of course for your viewing pleasure. Sorry for the confusion. I worked very hard to get the tank to where it is. And so you know, all the corals and polyps in the tank where all aquacultured frags, except the clams (wife's obsession). I will get you the picture of the filtration later tomorrow. Have a good day! I'm very new to the Marine hobby, so please bear with me if I'm asking silly questions. I did do some searching but could not find exactly what I was looking for, so I apologize if these questions have been asked many times before!! I am in the process of setting up my first attempt at a Marine FOWLR aquarium. I have a 180g tank with a 40g homemade sump; I have a mag 12 main circulation pump and a mag 9.5 running an AquaC EV150 skimmer. I have 2 Hydor Koralia 4 powerheads. Lighting is Current USA SunPaq 36 inch 96 watt X 2. When I get the tank stable and ready for livestock I was hoping to have the stock list below. 1 Cow fish <Not a fan of these, have been known to take out entire tanks.. In late Feb this year I filled the tank with water to check out the plumbing was watertight, then added salt and left it running. On March 2nd I put in 60lbs of live rock, and then about a week later added 3 salt waterized Mollies, then on the 14th I added another 80lbs of live rock. I've ordered another 50lbs of GARF Aragocrete, so as soon as that shows up I'll add it to my tank, so I should end up with a little less than 200lbs of Live Rock. I've been checking my Ammonia, Nitrite, Nitrate and PH levels since the 7th Mar. All the levels other than PH appear to be reading 0 (PH is at 8.4)....My questions are, is this normal for the cycling to take this long to start detecting some Ammonia? Does the set up as I have it seem OK for my intended stock levels or would you recommend more filtration? If so what would you recommend?? Bit of a bummer about the computability issues with Puffers and Lions!. My home made live rock from GARF came yesterday, so I added that to my tank, I now have just a little over 180lbs in there, about 135lbs of it was ready cured from mature setups. Strangely enough the tank still looks like it could use another 30 - 40 lbs! The reason for my note is, I checked my levels last night just after adding the GARF rock, and I have a 0.25 Ammonia reading!! Nitrite and Nitrate still at zero but PH is now gone from 8.4 to 8.2, is this the beginning of my ammonia spike? Or do you think, as you said in your reply, that as I have used established Live Rock that the tank has all ready cycled? What should my PH levels be doing? With Ammonia present should they be going up, down or staying static? When my tank is completely cycled and stable, what are acceptable levels? At what test readings should I do water changes at? What is, and how do I check alkalinity? Is that the reading I get off my hydrometer? <No> I checked that and it was reading 1.018, but I have no idea what that means!! night, I now have loads of them! Are the algae and Aiptasia anemones a normal problem with a new setup? And how do I control it?? First I got to say that your website is great and has been very informative. But I do have a question about a few things. I must add that I'm just getting started in the saltwater hobby and I am on line a good part of everyday looking at different resources to better educate myself. added the salt to get the salinity right. I am pretty sure the live rock I bought was uncured (it was light colored without any growth on it). Well now I am reading that I should have pre-cured it before adding to my tank. About a week later I picked up another small piece of Caribbean live rock maybe a pound or so that was covered in growth (tiny little feather dusters as well as other things) and added it as well as another small piece of Fiji rock that was covered with coralline algae and added both to the tank with the other rock. I picked up a few hitch hikers (a tiny white star fish and a tiny little snail). Everything seems to be okay but the purple coralline is turning white and the larger rock was getting covered with brown algae so I have been leaving the lights off. Is the uncured rock going to hurt the other stuff in the tank? I also added a friends blue Damsel fish for about two days and it did fine as well and I noticed when I was taking the damsel out and had to remove the large rock that it has a foul odor. Up until a week ago I had been testing my water parameters with an API saltwater kit and was getting good readings myself but I took a sample to my LFS (about an 1 hour and 15 min drive) and they said my nitrites and nitrate levels were still really high and to leave my tank alone so I ordered one of their kits ( a Hagen master kit) and returned the API kit because I thought it may not be any good. I was getting ready to add my first fish and everything but until I get the kit I ordered and can check my water again I will hold off. Anyways I guess my main question is will the uncured rock mess up anything during the curing process and should I wait any longer (if my water tests are okay) to add any livestock? Definitely do not add any livestock until the nitrogen cycle is complete. Cycled?? SW 7/28/07 Thank you all for your site. It has taught me a lot. <Good> I am curious about the possibility of my tank being cycled. For a little background: I have a 29g FOWLR (only about 3lbs of LR then, lots of base rock), I completely restarted the whole tank over again due to an ich problem. <Seems a bit drastic but ok.> The ONLY thing I kept from the first go around was my LR. I also added a few more pounds of LR for a total of about 8lbs. The tank has been running again for 22 days. With a pH of 8.2, my Ammonia and Nitrites have been 0ppm the WHOLE time. My Nitrates were at 0 the first two weeks and at 5-10ppm the last week. (My 2 fish are in my QT tank, so there are no fish in the display to supply ammonia). <The LR will provide some.> I have added bacteria culture, fish flakes and even fish waste to try to get the ammonia to spike. Nothing. I was really thinking I would see my ammonia start to climb by now to start the cycling. Is it possible that the tank is cycled? <Seems like it has.> I really was not expecting that for weeks to come. I am starting to see brown algae growth on the sandbed also. I am seeking your professional opinion, because after hours of reading on your site I just can't come to my own conclusion on what's going on (cycled or not?). <The nitrates would seem to indicate it has cycled.> I would hate to keep my fish in a tank fighting ammonia if I have a cycled tank they could be moved to! <Need to let the old LR be fallow at least another couple of weeks to be sure the ich is gone.> Thank you so much in advance for any advice! !